Fulvic acid is a potent source of minerals and other nutrients which outperforms even the most nutrient dense fruits and vegetables. Convenient liquid formula contains extracts of fulvic acid and added minerals to support the function of a healthy body. Purchasing this product today earns you 35 DR Reward Points! A well-rounded diet needs a healthy dose of essential and trace dietary minerals. These valuable nutrients cannot be produced in the body, so they must be ingested as a part of one’s diet. Fulvic acid is a potent source of minerals and other nutrients which outperforms even the most nutrient dense fruits and vegetables. This convenient liquid formula contains extracts of fulvic acid and added dietary minerals to support the function of a healthy body and mind. Fulvic acid is known as one of two ‘humic substances’. This means that it is a compound of soil, peat, coal and other forms of decomposed organic matter which happen to be packed with essential minerals and other valuable nutrients. These include hormones, fatty acids, ketones, flavonoids, and vitamins. 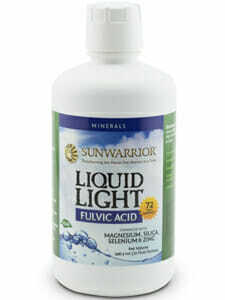 Liquid Light from Sunwarrior offers a cold-processed liquid extract of fulvic acid. This extract includes ionic trace minerals which support the body’s capabilities for transporting and utilizing other nutrients. Fulvic acid is an all-natural nutrient support system for a healthy body and mind. An essential mineral is defined as a nutritional substance which occurs naturally in the earth, but not in the human body. A trace mineral is a very similar substance, but the body requires them in much smaller quantities. Vegetables are the most common source of dietary minerals because they absorb them through the soil. However, fulvic acid is thought by many to be a more complete and bioavailable source of minerals which is capable of providing holistic nutritional support. Not only does the Liquid Light fulvic acid extract contain a potent dose of essential and trace minerals, the formulation also contains added minerals magnesium, silica, zinc, selenium and more. The ionic trace minerals extracted from fulvic acid are thought to support the body in absorbing and utilizing other forms of nutrient. Dietary minerals in general provide vital nutritional support to the cardiovascular and immune systems of the body, as well as powerful antioxidant properties.1 A healthy human body thrives on a diet which is rich in essential and trace dietary minerals! Take one capful per day. May be mixed with your favorite beverage. Store out of direct light and away from heat. Note: This product is non-GMO, gluten free, and vegetarian.